Other comments: I was conceived on board Kandy. It was 1967, my parents had arranged to meet friends for a short cruise in Brittany but upon arrival in Lézardrieux the weather had turned against them. They were stuck with time on their hands whilst Charles and Sheila Kenlock (who later became my godmother) were holed up further West in L’Aber Wrac’h waiting for the depression to pass through. Kandy is a Laurent Giles Vertue, built in 1951 of mahogany and oak by Woodnutts on the IOW for James Holman. Scrap Batten (RCC) bought her from him in 1954 and then sold her to my grandfather in 1959 just before taking on Dyarchy. Gramps had many happy years sailing Kandy the length and breadth of the English Channel, often pressganging his junior office staff to act as crew under the pretence that they had an important all day meeting near Poole on a Friday. Many of them, including Charles Kenlock, went on to become keen yachtsmen. 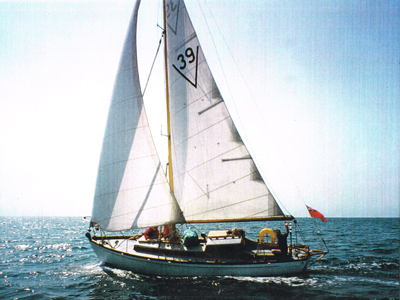 My father then took over and we enjoyed family holidays on board until he sold her in 1980, not least because my mother felt we spent more time sanding her bottom all winter rather than sitting on top in the summer, I often wondered what became of her. There were tales of sightings in Salcombe and other West Country ports although I now know she had seven further owners before coming ‘home’ . In 2007 I heard she’d been seen in the yard at Weir Quay near Plymouth but had recently moved. After some detective work I managed to track her down and got hold of the owner who was in the process of refurbishing her himself at Keyhaven, Hampshire. I went and met him to have a look but was somewhat dismayed to see the state that she was in. My offer to buy her was politely turned down as he wished to finish what he had started but I made him promise that he would give me first refusal if he ever decided to sell. We kept in touch and in July 2013 he rang up admitting that he had rather given up on the project and was worried about her deteriorating further if something wasn’t done soon. I agreed to go for another look and we shook hands at a price that reflected her condition. My excitement at having recovered an old friend was tempered by his relief at offloading what had become a burden. I arranged for a lorry to bring her home, bought David Batten’s (RCC) old steel cradle, modified the arms with some new accro props and pushed her into a barn where she will undergo a thorough refit. I managed to get her home without my father finding out so it was a big surprise for him when I rang to say, ‘There’s something I want you to come and see’. My mother’s reaction was rather more predictable, ‘that bloody boat, I thought I’d seen the last of it’!! Whereas Jo was surprisingly accepting of the situation once I had used an equine analogy explaining that it was rather like Joey returning to the farm at the end of ‘Warhorse’. My evenings and weekends will be busy for the foreseeable future but as the saying goes, ‘All good things come to he who waits’. The Club burgee is on its staff ready for hoisting and it will be an emotional day when we eventually get Kandy back in the water for her next adventures.